By establishing order in your refrigerator and freezer — spaces you access at least three times a day — you’ll enjoy a stress-free meal preparation experience. Plus, you won’t forget (or overlook) ingredients you already have on-hand — a major money-saver. Read on to learn the recipe for successful organization in your most often used kitchen appliance — the refrigerator! The first step in organizing your fridge and freezer is to take inventory and discard out of date items or items you will not likely use. 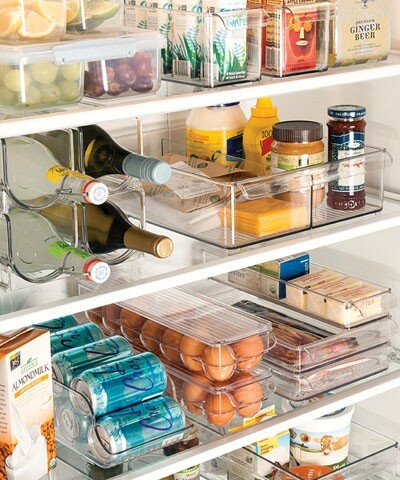 Take advantage of adjustable shelves and drawers, found readily in most new appliances. Since many shoppers like to buy the same brands (with the same packaging) over and over again, taking time to set your shelves and drawers accordingly will save you time in the long run. Organize food items by size. Doing so will create a function for each shelf and make it much easier to locate your small, hard to see items. Store items in jars or bottles in the refrigerator door and bagged items in the freezer door. Look for organizers that maximize shelf space — for example, shelves or dispensers that can be added to existing shelves to maximize the vertical space. Keep the most often used items in front for easy access the whole family will appreciate. You may also find that ready-made snacks are helpful to curb your cravings — fresh fruit or veggies that are pre-washed and ready to eat will suddenly seem more enticing! Everybody has a small shelf that never seems quite big enough. Put it to use with leftover storage because containers that stack and are similar in shape will maximize the deep, narrow space. Don’t forget to label your items before storing them! To combat odors keep an open box of baking soda in the back corner. Vanilla extract will also keep your fridge fresh. Soak a cotton ball or paper towel, put it on a paper plate and wait for it to dry before removing.